RALEIGH, N.C. -- One of the largest tobacco-farming cooperatives and maker of tobacco products, U.S. Tobacco Cooperative (USTC), named Oscar House its new president and CEO. House started his new leadership position on Jan. 15. He came from USTC’s manufacturing facility in Timberlake, N.C., called U.S. Flue Cured Tobacco Growers Inc., where he was the senior vice president of manufacturing. He has held other jobs in the tobacco industry, most notably, director of operations for Philip Morris International, New York, where he oversaw its Bogota, Colombia, operations. House will have responsibility for the day-to-day activities of the consolidated organization, as well as the development and implementation of annual, long-term and strategic plans. He will report directly to the USTC’s board of directors. The cooperative processes flue-cured tobacco grown by its 650 member growers in Florida, Georgia, South Carolina, North Carolina and Virginia. USTC processes and sells member-grower tobacco as raw materials to cigarette manufacturers worldwide. Subsidiaries of USTC include U.S. Flue Cured Tobacco Growers (USFC), Premier Manufacturing, Franchise Wholesale (doing business as Wildhorse Distributing), Big South Distribution and King Maker Marketing Inc. USTC, through its subsidiaries, also produces consumer products for the U.S. market under brand names of Wildhorse, 1839, Shield, 1st Class, Ultra Buy and Traffic. 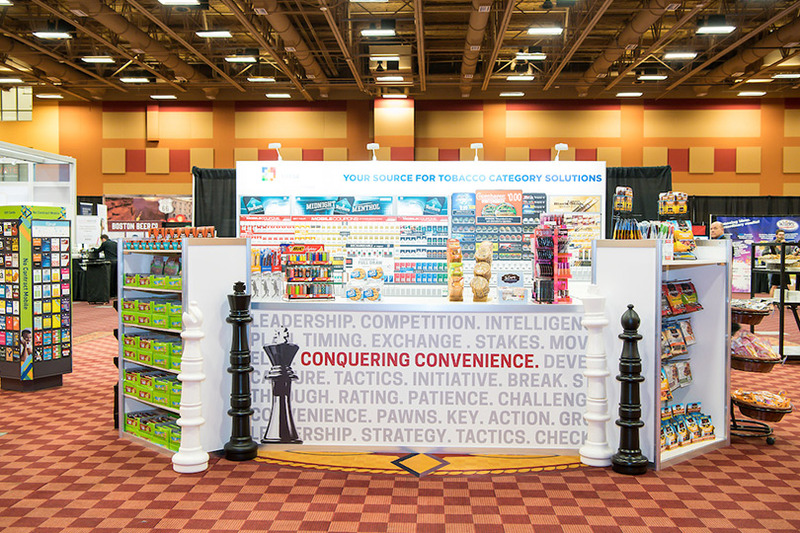 GLENDALE, Ariz. -- Retailers that attended CSP's Convenience Retailing University this past month got a glimpse of several new products in the conference Product Gallery. The conference was held Feb. 21-23 at the Renaissance Hotel in Glendale, Ariz.
Foodservice, packaged beverages, tobacco and other categories were represented courtesy of the conference sponsors. Tyson Convenience’s fully cooked chicken breast comes packed in a case with foil-lined wrappers and are available in spicy and home-style varieties. Retailers need to simply add a locally sourced bun, and the sandwiches can be held in a warmer for grab-and-go. EasyGo Drinkware from Whirley-DrinkWorks! offers customizable, vacuum-insulated to-go cups that keep beverages hot for four hours, or cold for 12 hours. 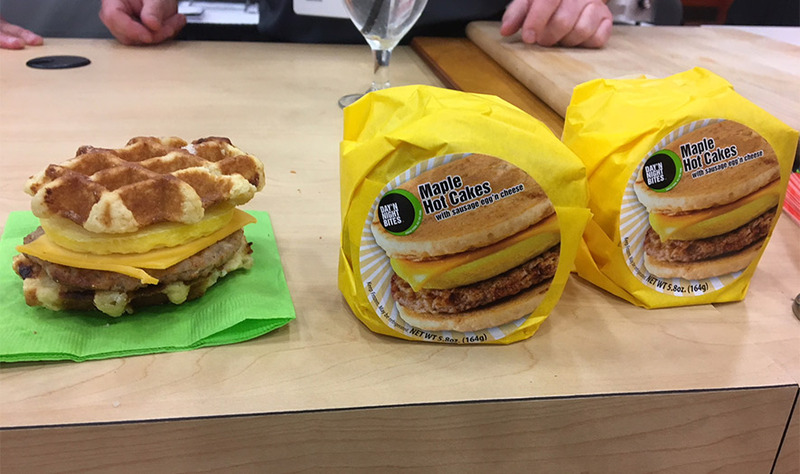 Capitalizing on a number of trends at once (sweet and savory, meal mashups and breakfast sandwiches), Land Mark Products Inc. (pictured) showcased its egg, sausage and cheese breakfast sandwiches featuring waffles and hot cakes instead of a bun. 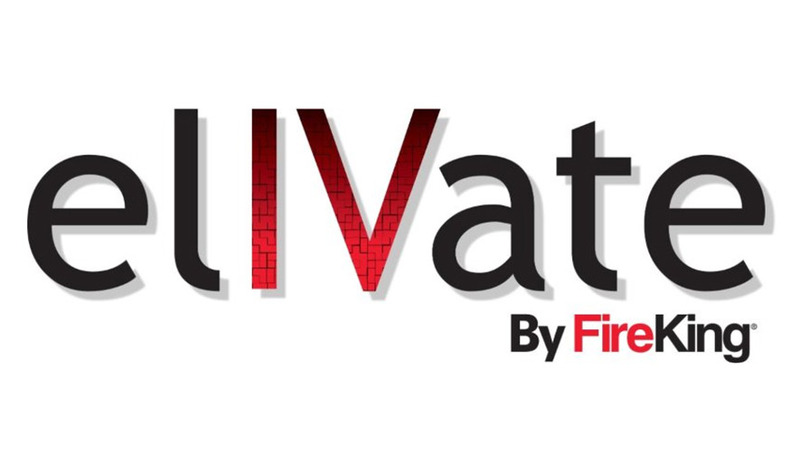 New Albany, Ind.-based FireKing Security Group offered looks at its recently launched video intelligence platform called Elivate. The product incorporates cameras with point-of-sale (POS) systems, internet of things (IoT) devices, environmental controls, smart safes and other technology. Elivate is designed to incorporate new systems and locations as businesses and IoT tech develop. The program includes a single online portal, where users can find a dashboard to monitor, review, analyze and respond to data from any computer or mobile device. 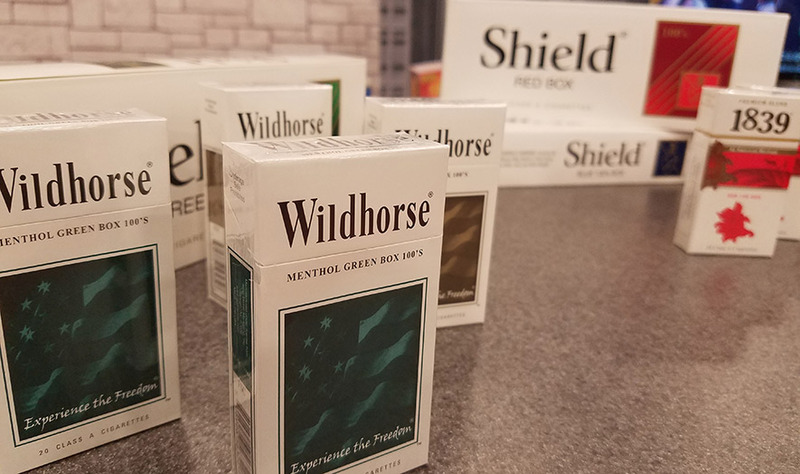 The consumer products division of U.S. Tobacco Cooperative Inc. (USTC), Premier Manufacturing of Chesterfield, Mo., featured Wildhorse and Shield cigarette brands (pictured) on the CRU exhibit floor. Taking on the closed-system market, Space Jam Juice, San Clemente, Calif., showed CRU attendees its new Byrd device, which uses replaceable, flavored pods instead of e-liquids. San Francisco-based Juul Labs showcased its vaping device, one that has seen significant growth in the c-store channel in recent months. The Sleep Walker from Max Distributing, Little Rock, Ark., is a shot or capsule dietary supplement that aims to increase focus and mood. Boston Beer Co., Boston, featured new Sam '76, a combination of lager and ale beers, as well as Angry Orchard Rose and Truly Spiked & Sparkling Wild Berry. Nestle Waters North America shared its newly reimaged sparkling versions of its regional water brands. 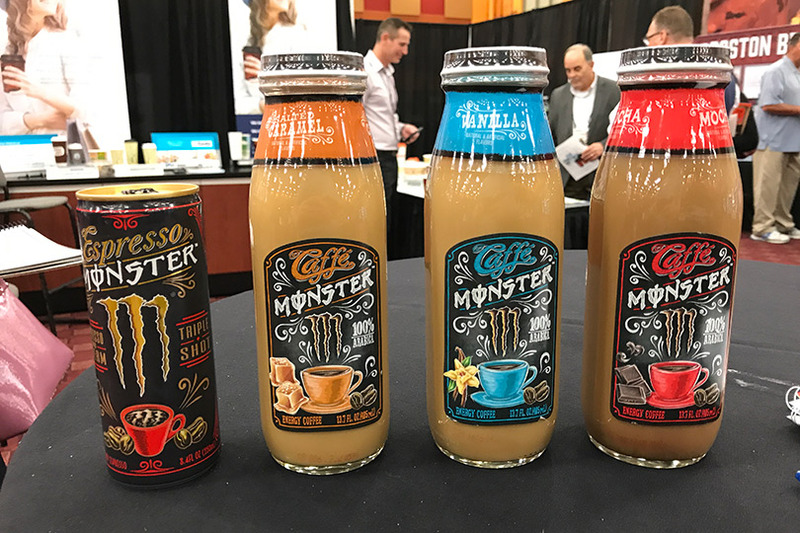 Monster Beverages debuted its long-awaited Caffe Monster and Espresso Monster (pictured). Dr Pepper Snapple Group featured a line extension of its Canada Dry Ginger Ale that combines ginger ale and lemonade. Premier Nutrition Corp., known for Power Bar and Premier Protein shakes, brought its new Premier Protein Clear isotonic drink to c-stores for the first time. And Hype Energy introduced two new flavors of its namesake energy drink: Tropical and Cherry Blend flavors. Farm Bill to Ignite Hemp Combustibles?